This test determines the lactate threshold during exercise, which can be used to aid in determining an appropriate training intensity and monitor progression in the serious athlete. This test is similar to the VO2max test, but with slightly longer periods of time between changes in workload. 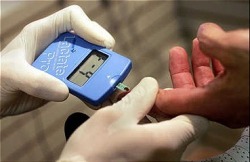 This test does involve several blood samples taken from the finger for the assessment of blood lactate. It is not considered a maximal test but does require a high intensity effort. Lactic acid production is not all bad. If we could not produce lactate, our ability to perform brief high intensity exercise would be almost eliminated. However, As I am sure you are aware, lactic acid is the demon of the endurance athlete. Cellular accumulation of the protons (increased acidity) that dissociate from lactate results in inhibition of muscle contraction. Blame those heavy legs on the protons! The bottom line is that exercise intensities above the LT2 point can only be sustained for a few minutes to perhaps one hour depending on how high the workload is above the intensity at which lactate production exceeds maximal rates of removal. Exercise between LT1 and LT2 intensities are often sustainable for 1-2 hours, depending on glycogen availability and where within that range we are exercising. Exercise below LT1 can be potentially sustained for hours, if hydration status and other factors are controlled.